This is an installment of the MeFi Horror Club. If you are interested in choosing the next film, please let me know. I just finished watching this for the first time since childhood and I am pretty surprised by how...not bad (?) it is. I mean the whole thing is ridiculous, but it was obviously professionally and competently made. I was expecting it to be difficult to sit through, but the film was engaging. It definitely falls far on the comedy side of the horror-comedy spectrum, but some parts were definitely freaky. The ventriloquism scene (foreshadowed by Mooney saying "I'm no dummy" no less!) and the bathroom scene to name two. Also, the costumes were good and the clown teeth were uncomfortably gross. All in all, I am surprised at how decent (I hesitate to say good) this movie is. And it is so quintessentially '80s, wow feathered hair! What you going to do with those pies, boys? Such a great, stupid, wonderful film. 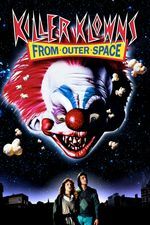 I completely agree that the makeup is much better than I remembered from my first VHS watching -- yeah, they're clowns. But they're also shiny and disgusting aliens. Yeah Gucky, I imagine that part escaped 12 year old me because I was likely watching it on some staticky UHF channel on a third hand 29" console TV with the sound down low so my parents wouldn't catch me up way past my bedtime.